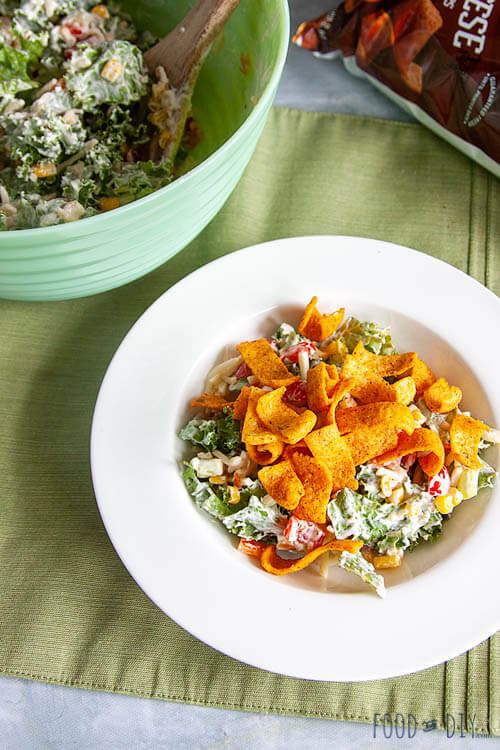 Kale Corn Chip Summer Salad. Admittedly that title sounds a bit like “ummm, gross?” but believe me, it is SO GOOD. Bell peppers and grilled corn round out this delicious summer salad. I had this salad for the first time at a dear friend’s house in Texas. I wasn’t really paying attention to the salad when I was piling my plate high with all the good food. But once I had my first bite I knew that I HAD to have it again!! I texted my friend for the recipe and told her I wanted to post this salad on my blog. That was almost 3 years ago. I don’t even know why so much time passed before I made and posted this recipe. The first time my husband tried this salad he LOVED it! He even asked me to make it for a family dinner we had recently and everyone else love it as well! I know when you see the ingredients you are kind like “Really? does that work together? Are you sure?” But just trust me. This salad is seriously my favorite salad right now. 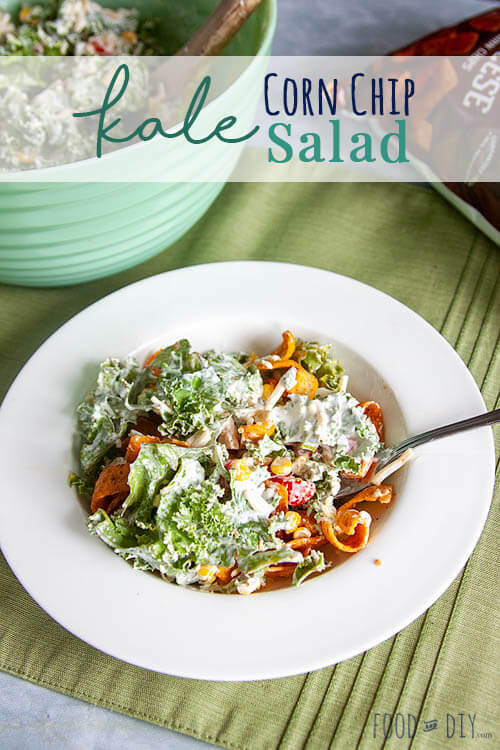 What makes this salad great for potluck dinners or taking to a family gathering is that since you make this salad with kale, the kale doesn’t get soggy and gross! You, of course, need to wait to add the corn chips until you serve the recipe or they will definitely get soggy, and that is no bueno. This is what you need, red bell peppers, yellow or orange bell peppers, grilled corn, green onions, shredded cheese, kale, sour cream, real mayo, ranch dressing mix and corn chips (not pictured). You are going to toss all the veggies and the cheese together in a bowl. Meanwhile, whisk the sour cream, mayo, & ranch dressing mix until it’s blended all together. Then add the dressing to the veggies. Toss well until it’s all nicely mixed together. That is it! It’s super easy to toss together. 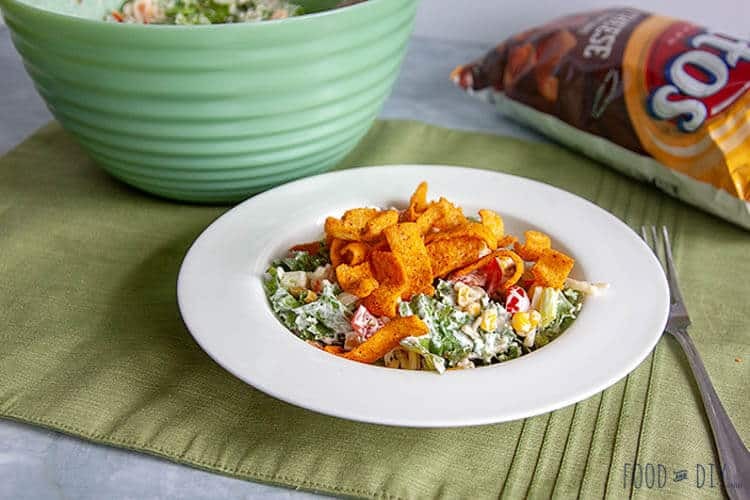 When you are ready to serve, you can stir in corn chips to the entire salad, or you can let each person top their salad with corn chips. You can use plain corn chip OR add some nice flavor by using chili cheese corn chips! Kale Corn Chip Summer Salad. Admittedly that title sounds a bit like "ummm, gross?" but believe me, it is SO GOOD. Bell peppers and grilled corn round out this delicious summer salad. Deseed the peppers and diced them and the green onions. If you didn't buy pre-chopped kale, chop it into bite-sized pieces. In a separate bowl, mix the sour cream, mayo, and ranch dressing mix together. 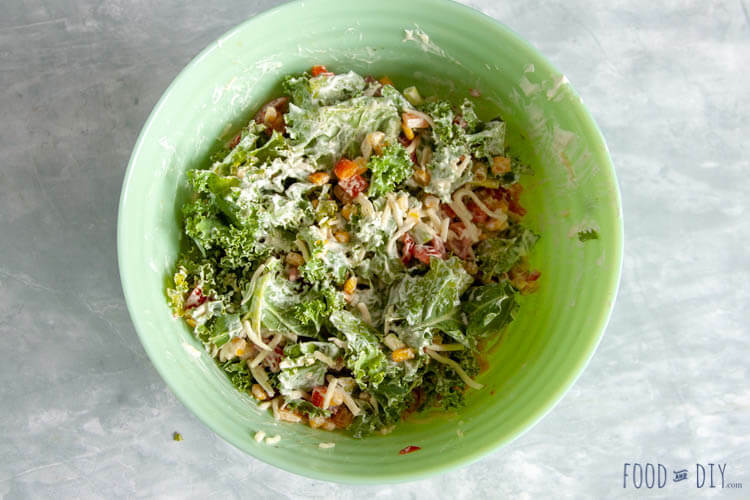 Toss all the veggies & the shredded cheese in a large bowl, once they are evening mixed, add the sour cream mixture, toss until everything is coated evenly. If you are serving immediately you can go ahead and add the corn chips but if you aren't serving right away, wait to add the chips later. If you think you'll have leftovers you can also just let everyone top their salads with corn chips individually. I love the colors in this salad the most … but have to say the flavors are some of my summer favorites. So, can’t go wrong serving this salad, I suppose. Mmm, mmm! 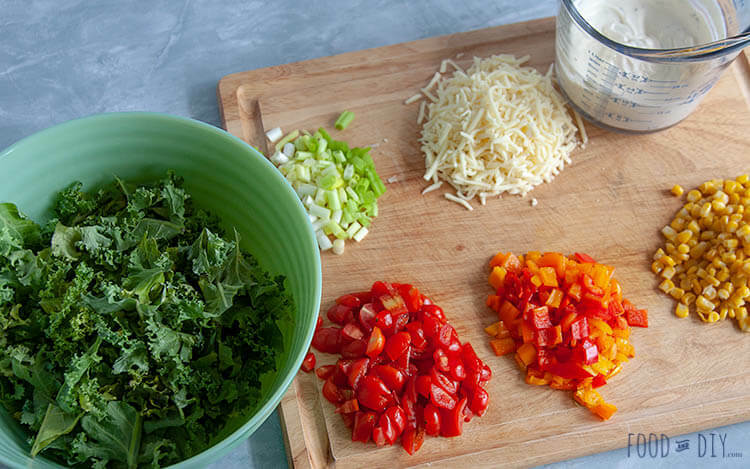 Kale, peppers, green onions and cheese – sign me up! This looks like a delicious salad! Now this is my type of salad! I have a salad I make called Firehouse salad that I make with fritos but you are using CHILI CHEESE fritos!! YUM! My husband is going to adore this salad! Isn’t that funny how that happens sometimes!? The addition of crunch to kale salads is so key! Your salad looks SO creamy and delicious. What a great combination of ingredients, and so colorful too. I’ve gotten really into kale salads lately and oh my, corn chips in salad! This seems like a must try!! I can see why this salad made you pause. It may not be summer but I bet I could get all of those ingredients and make it. It sounds delightful and I would certainly enjoy the crunch of the corn chips. For sure this salad could also be made in the fall or winter! This sounds seriously delicious! I am from Texas too, and the first time I saw corn chips in a salad I was a little surprised. But, it is SOOOO surprisingly good! My husband loved it too. This one looks delicious! what a great looking salad! I love the idea of adding corn chips to it, must give the salad nice crunch! Great for any family or friends gatherings! Yes! It is PERFECT for gatherings because the kale doesn’t wilt! OMG corn chips in my salad? It’s so wrong that it makes it right! 🙂 I always need that crunch..so I can’t wait to switch things up and try this. YEA!!! I hope you love it! It’s super awesome!! I wouldn’t mind this salad, at all! And neither my husband. It sounds so yummy with the addition of corn chips, but still healthy enough with kale 😉 . Yes! It really is the best salad ever! YUMMY! 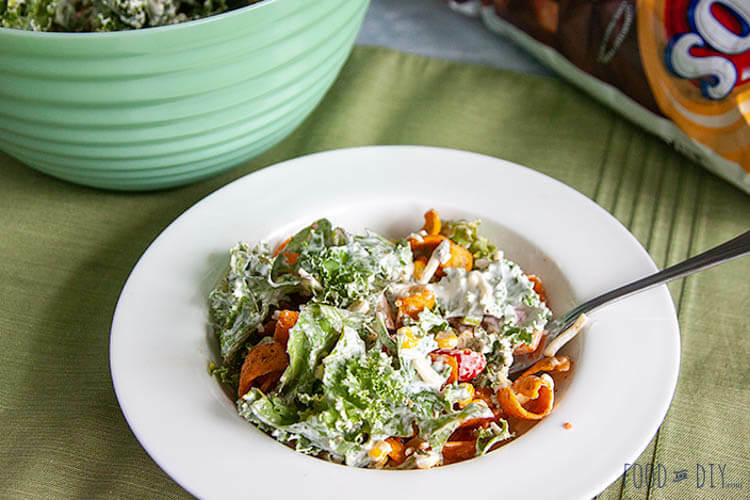 This recipe reminds me of this Mexican kale caesar I recently had at a Mexican restaurant a couple of weeks ago.. it was incredible, was loaded with mexican cheese and corn chips! Your recipe looks absolutely delicious, the addition of the corn makes me oh, so hungry. Thanks for sharing, I can’t wait to give this recipe a try! Thanks you so much!!! If you try it out I hope you love it as much as we do! My husband LOVES corn chips. I will surprise him, and make this salad. I know he will love it. AWESOME!! I hope he loves it! Thank you so much! They are the perfect addition! I’ve never added corn chips to a salad, but this would make for a great crouton substitution! This looks like a salad I can get on board with. YUM! Corn chips do sound crazy at first! But once you try it I bet you’ll love it! 🙂 Thanks for stopping by!